As a banker has rightly commented in the past, “Farm loan waivers are almost like peer pressure to default.” This is exactly what seems to have happened in the last 8 years. Farm loan waivers are not new to India. The government has long tried to keep the farmer lobby happy by writing off their loans. At times, such loan write-offs are justified. For example, drought conditions or a failure of a crop or flooding could all be reasons beyond the control of the farmer. In such cases, the farmer already bears the loss of crop failure and putting the added burden of loan repayment would only make matters worse. However, quite often farm loan are also used as a pre-election strategy as a populist measure. In 2008, the UPA government wrote off farm loans worth ~Rs50,000cr and this was possibly instrumental in the party romping back to power. Recently, we have seen massive loan waivers offered in states such as Uttar Pradesh, Telangana, and Karnataka. These waivers were part of pre-poll promises which the parties were bound to deliver. The RBI governor, Dr. Urjit Patel, has highlighted that bank loan waivers are typically borne by the respective state governments, and hence, there is no impact on the bottom-line of banks. Banks only provide a temporary write-off, but the eventual liability is on the state government. The most indebted states of Uttar Pradesh, Madhya Pradesh, Maharashtra, Karnataka, and Punjab had taken farm loan write-offs to the tune of Rs1,08,000cr. In fact, it is estimated that the total farm loan write-offs by the time of the central elections in 2019 could actually cross Rs200,000cr. The entire burden will vest on the state government budgets and not on the banks; therefore, technically, the balance sheets of banks will not worsen significantly due to this write-off. The only worry is the impact that it will have on the combined fiscal deficits of all the state governments put together. For fiscal year 2017-18, the state fiscal deficit is estimated at 2.7% of the GDP, however, if the full impact of the loan write-offs is factored in, the actual state fiscal deficit could be closer to 4-5%. This could put pressure on most states’ finances. 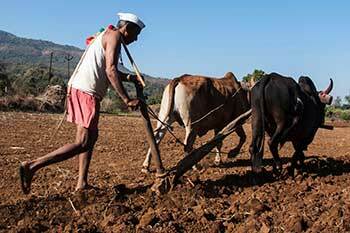 Do farm loan waivers make farmer defaults a norm? One of the principal arguments against farm loan waivers is that they create a kind of moral hazard for lenders. Take the example of the first major loan waiver announced by the UPA government in 2008. At that point of time, the agricultural NPAs were a tad below 2% of the entire agri loan book. Between 2009 and 2017, the agri NPAs have gone up sharply from less than 2% to ~6% of the loan book. This surely indicates that agri NPAs have actually become a norm after the waivers have started and despite consecutive waivers, the NPAs have only risen. As a banker has rightly commented in the past, “Farm loan waivers are almost like peer pressure to default.” This is exactly what seems to have happened in the last 8 years. Agricultural lobbyists argue that the overall agricultural NPAs are still way below the level of NPAs that we get to see in industrial loans. However, that is off the point. It would have been easier to justify the burden had the farm sector actually benefited. Yet, the large part of waiver benefits go only to large farmers, and marginal farmers are still dependent on unofficial moneylenders to get money at usurious rates of interest. The second concern is that it is just cosmetic help for banks in the sense that the loan goes out of the books of the bank and gets replaced by a bond issued by the state government. So visually, the NPAs appear to have come down in rupee terms. But for the state governments, this is a debt obligation that has to be serviced by paying interest on these bonds. If one wants to really understand the size of the burden, consider the two schemes discussed below. The farm loan waivers are likely to add Rs2tn to state debt and the Power UDAY scheme has already added Rs3tn to the state debt. This means that the combined state fiscal deficit could be closer to 5% of the GDP, which is an unsustainable level for most states. The other aspect is the states’ borrowings as a percentage of the GSDP (Gross State Domestic Product). It is estimated that the borrowings could increase the debt/GDP ratio by 6-10% , which could impact their credit standing. Farm loan waivers may appear to be visually simple, however, the damage they do to state finances is much more complex than is visible on the outside.